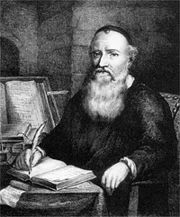 The Mennonites are a group of Christian Anabaptist denominations named after Menno Simons (1496-1561), although his teachings were a relatively minor influence on the group. As one of the historic peace churches, Mennonites are committed to nonviolence, nonviolent resistance/reconciliation, and pacifism. There were about 1.5 million Mennonites worldwide as of 2006. Mennonite congregations embody various traditions from old fashioned 'plain' people to those who are indistinguishable in appearance from the general population. Mennonite experience in Europe and North America has been, and continues to be, predominantly rural. The largest population of Mennonites is in Africa, but Mennonites can also be found in tight-knit communities in at least 51 countries on six continents. The Anabaptists—and the Mennonites and Amish coming out of the Anabaptist movement—have usually maintained a strong sense of their group as separated from other people or groups, whether Catholic, Protestant, Jewish, pagan, or anyone else. This came about partly because of their rejection of infant baptism and of participation in the state and its institutions, and partly because they were persecuted by both Catholics and Protestants; but largely because they saw and still see themselves as a separate priestly group, set off from the rest of humanity. Mennonites often use the phrase Separated Unto God for their stance, citing such Biblical passages as: "Come out from among them, and be ye separate, saith the Lord, and touch not the unclean thing; and I will receive you, and will be a Father unto you, and ye shall be my sons and daughters, saith the Lord Almighty" (2 Corinthians 6:17-18). Some Mennonites are evangelical, actively seeking converts, and others are not. For those groups that are not evangelical, virtually all of their members come from people who are born into the group. Despite this, Mennonites place a strong theological emphasis on service and have won international distinction among Christian denominations in disaster relief. The Mennonite Disaster Service, based in North America, provides both immediate and long-term responses to hurricanes, floods, and other disasters. The Mennonite Central Committee provides disaster relief around the world alongside their long-term international development programs. Other programs offer a variety of relief efforts and services throughout the world. In the last few decades some Mennonite groups have also become more actively involved with peace and social justice issues, helping to found Christian Peacemaker Teams and the Mennonite Conciliation Service. This has tended to take them out of their traditional notion of being a separate entity, different from everyone else, and led these groups into political and religious alliances with members of other religious organizations and even non-religious peace activists. The early history of the Mennonites begins with the Anabaptists in the German and Dutch-speaking parts of central Europe. These forerunners of modern Mennonites were part of the broad reaction against the practices and theology of the Catholic Church known as the Protestant Reformation. Its most distinguished feature is the rejection of infant baptism, an act that had both religious and political meaning, since almost every infant born in Western Europe was baptized into the Catholic Church. Other significant theological views of the Mennonites developed in opposition to Catholic views or to the views of fellow reformers like Martin Luther and Ulrich Zwingli. Thus the Anabaptists sometimes claim to be neither Catholic nor Protestant, but a third different group. This claim is bolstered by the fact that they were persecuted and sometimes killed as heretics by both Catholics and Protestants. Some of the followers of Zwingli's Reformed church felt that requiring church membership beginning at birth was inconsistent with the New Testament example and that people should join only once they were willing to publicly acknowledge that they believed in Jesus and wanted to live in accordance with his teachings. They also believed that the church should be completely removed from secular government. At a small meeting on January 21, 1525, Conrad Grebel, Felix Manz, and George Blaurock, along with 12 others, baptized each other. This meeting marks the beginning of the Anabaptist movement. In the spirit of the times, many radical groups followed, preaching any number of ideas about hierarchy, the state, eschatology, and sexual license, running from utter abandon to extreme chastity. These movements are together referred to as the Radical Reformation. Many government and religious leaders, both Protestant and Roman Catholic, considered re-baptism of adults to be heretical and voluntary church membership to be dangerous. Often further concerned by reports of the Münster Rebellion, led by a violent sect of Anabaptists, they joined forces to fight the movement, using methods as imprisonment, banishment, torture, and sometimes execution. Anabaptists were also frequent victims of mob-violence. Despite the best efforts of the state churches, the movement spread in Western Europe, primarily along the Rhine. Some historians have suggested that if the Anabaptists had not been so relentlessly persecuted, they would have become the dominant religion of Europe. Many of the earliest Anabaptist leaders were killed in an attempt to purge Europe of the new sect. By 1530, most of the founding leaders had been killed for refusing to renounce their beliefs. Many Anabaptists believed that God did not condone killing or the use of force for any reason and were therefore unwilling to fight for their lives. These pacifist branches of the movement often survived by seeking refuge in neutral cities or nations, such as Strasbourg. Their safety, however, was often tenuous, as a shift in alliances or an invasion could mean resumed persecution. Other groups of Anabaptists, such as the Batenburgers, were eventually destroyed by their very willingness to fight. This played a large part in the evolution of Anabaptist theology. In the early days of the Anabaptist movement, Menno Simons, a Catholic priest in the Netherlands, heard of the movement and started to rethink his Catholic faith. He questioned the doctrine of transubstantiation, but was reluctant to leave the Roman Catholic Church. His thinking was influenced by the death of his brother, who, as a member of an Anabaptist group, was killed when he and his companions were attacked and refused to defend themselves. In 1536, at the age of 40, Simons left the Catholic Church. Soon thereafter he became a leader within the Anabaptist movement. He would become a hunted man with a price on his head for the rest of his life. His name became associated with scattered groups of nonviolent Anabaptists he helped to organize and consolidate. During the sixteenth century, the Mennonites and other Anabaptists were relentlessly persecuted. The first recorded account of the group is in a written order by Countess Anne, who ruled a small province in central Europe. The presence of small groups of violent Anabaptists was causing political and religious turmoil in her state, so she decreed that all Anabaptists were to be driven from her state. The order made an exception though, for the non-violent branch known at that time as the Menists. This order set the precedent that was to be repeated many times throughout history, where a political ruler would allow the Menists or Mennonites into his/her state because they were honest, hardworking and peaceful. However, inevitably, their presence would upset the powerful state churches, princes would renege on exemptions for military service, or a new monarch would take power, and the Mennonites would once again be forced to flee for their lives, usually leaving everything but their families behind. Often, another monarch in another state would grant them welcome, at least for a while. One example was Elizabeth I of England. There, in a small village in Britain, a group of Dutch Anabaptists made the acquaintance of a congregation led by John Smythe, who would later lead his Pilgrims to the Netherlands and then to America. The Pilgrims' exposure to the Dutch Mennonite congregation probably influenced some of their teachings, including the freedom of each branch to regulate itself. In addition to the Mennonites' impact on the first American Pilgrims, religious historians have traced their influence to other religious teachings. This included the Baptists' emphasis of adult baptism upon confession of faith, and the Religious Society of Friends' (Quakers) strong stance against war. The dissemination of Anabaptist beliefs helped build the religious freedom that is enjoyed in America today. Later, while Mennonites in Colonial America were enjoying a large degree of religious freedom, their counterparts in Europe were in the same situation they always had been. Their well-being still depended on a ruling monarch, who would often extend an invitation only when there was poor soil that no one else could farm; the exception to this rule being in the Netherlands, where the Mennonites enjoyed a relatively high degree of tolerance. Sometimes a ruler would not drive out the Mennonites, who gained a reputation as excellent farmers, but would actually pass laws to force them to stay, while at the same time severely limiting their freedom. High taxes were enacted in exchange for continuing the military service exemption and/or as an exit tariff on those who wished to emigrate. In some cases, the entire congregation would give up their belongings to pay the tax to be allowed to leave. Mennonites had to build their churches facing onto back streets or alleys, and they were forbidden from announcing the beginning of services with the sound of a bell. A strong emphasis on community was developed under these circumstances and continues to be typical of Mennonite and Amish people. As a result of frequently being required to give up many possessions in order to retain individual freedoms, Mennonites learned to live very simply. This was reflected both in the home and at church, where their dress and their buildings were plain. Even the music at church, which was usually simple German chorales, was performed a cappella. This style of music serves as a reminder to many Mennonites of their simple lives, as well as their history as a persecuted people. Some branches of Mennonites have retained this "plain" lifestyle into modern times. German-Russian Mennonites were heavily influenced by Catherine the Great of Russia, who in 1768 acquired a great deal of land north of the Black Sea (in the present-day Ukraine) following a war with the Turks. She invited Mennonites living in Prussia to come farm the cold, tough soil of the Russian steppes in exchange for religious freedom and military exemption. By the beginning of the twentieth century they owned large agricultural estates and were even successful as industrial entrepreneurs in the cities. After the Russian Revolution of 1917 and the Russian Civil War (1917-1921) all of these farms (whose owners were called Kulaks) and enterprises were expropriated. Beyond expropriation, Mennonites suffered severe persecution during the course of the Russian Civil War, at the hands of both the Bolsheviks and the anarchists of Nestor Makhno. After the war, people who openly followed their religion were in many cases imprisoned. This led to a wave of Russian Mennonite emigration to the Americas (U.S., Canada and Paraguay). When the German army invaded the Soviet Union in the summer of 1941, many in the Mennonite community saw them as liberators from the communist regime under which they had suffered. When the tide of war turned, many of the Mennonites fled with the German army back to Germany where they were accepted as "Volksdeutsche." After the war, the remainder of the Mennonite community either escaped or were forcefully relocated to Siberia and Kazakhstan, and many were sent to the Gulag. In the 1990s the Russian government gave these people the opportunity to emigrate. Since within Anabaptism there is no central authority that can decide questions of doctrine and practice and then impose those decrees on the entire membership, there is little energy directed toward maintaining a central unity for all, and a great deal of energy toward breaking into separate groups when any reason deemed to be adequate to do so arises. The Anabaptist notion of being separated unto God also tends to encourage breaks and schisms because of the emphasis on separation from others who are thought not to be part of the "correct" flock. Such breaks have been frequent throughout the history of the Mennonites and the Amish, and have been important for the self-identity of Mennonite and Amish groups. By the seventeenth century, some of the Anabaptists joined the state church in Switzerland and persuaded the authorities to relent in their attacks. The Mennonites outside the state church were divided on whether to remain in communion with their brothers within the state church or to shun them, and this led to a split. Those against remaining in communion with them were led by Jacob Ammann, who in 1693 led an effort to reform the Mennonite church. Among his policies were to hold communion more often and especially to enforce shunning, the complete social ostracism of members who were deemed to have left the church. When the discussions fell through, Ammann and his followers split from the Mennonite church. The group became known as the Amish. 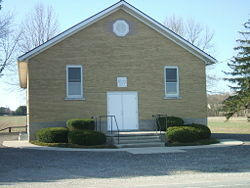 Those who remained in communion with the ones who had joined the state church retained the name Mennonite. The acrimony between the two groups was so severe that they reportedly refused to talk to each other when they found themselves together on the same boat sailing to America. To this day, shunning is practiced among most Amish and some Mennonites. Prior to migration to America, Anabaptists in Europe were divided between those of Dutch and Swiss-German background. However, both Dutch and Swiss groups took their name from Menno Simons, who led the Dutch group. A trickle of Dutch Mennonites began the migration to America in 1683, followed by a much larger migration of Swiss-German Mennonites beginning in 1707. Two centuries later, in the 1870s, significant numbers of Dutch Mennonites, who had settled in the German Kingdom of Prussia and then Russia, moved to the United States and Canada where they are now known as Russian Mennonites. After immigration to America, many of the early Mennonites split from the main body of North American Mennonites and formed their own separate and distinct churches, a process that began in 1785 with the formation of the orthodox Reformed Mennonite Church and is ongoing today. Many of these churches were formed as a response to deep disagreements about theology, doctrine, and church discipline as evolution both inside and outside the Mennonite faith occurred. Other divisions occurred because of geography. Still others came about because of power struggles between leaders, or even over something as seemingly trivial as what kind of clothing could or should be worn. Many of the 'modern' churches descended from those groups that abandoned traditional Mennonite practices. Near the beginning of the twentieth century, for another example, some members in the Amish church wanted to begin having Sunday Schools and evangelize. Unable to persuade the rest of the Amish, they separated and formed the Conservative Mennonite Conference. Mennonites in Canada and other countries typically form independent denominations because of the practical considerations of distance, belief and practice, and, in some cases, language, or for any of the reasons mentioned above. These historical schisms have had an influence on creating the distinct Mennonite denominations that exist today. Such divisions continue to go on today. A recent one is the expulsion of the Germantown Mennonite Church in Philadelphia, Pennsylvania, from the Franconia Conference. William Penn solicited settlers for his new colony among the Quakers and Mennonites in Germany, who were living under ongoing discrimination. The first permanent settlement of Mennonites in the American colonies consisted of one Mennonite family and twelve Mennonite-Quaker families of Dutch extraction who arrived from Krefeld, Germany in 1683 and settled in Germantown, Pennsylvania. This early group of Mennonites and Mennonite-Quakers wrote the first formal protest against slavery in America. The treatise was addressed to slave-holding Quakers in an effort to persuade them to change their ways. In the eighteenth century, 100,000 Germans from the Palatinate, collectively known as the Pennsylvania Dutch, (Deutsch refers to the German language) immigrated to Pennsylvania. Of these, around 2,500 were Mennonites and 500 Amish. This group settled farther west than the first group, choosing less expensive land in the Lancaster, Pennsylvania, area. A member of this second group, Christopher Dock, authored Pedagogy, the first American monograph on education. Today, Mennonites also reside in Kishacoquillas Valley (also known as Big Valley), a valley in Huntingdon, Mifflin, Lebanon, Lancaster, Franklin and other counties in Pennsylvania, as well as in numerous other states, including New York, Maryland, Ohio, Indiana, Kansas, and elsewhere. During the Colonial period, Mennonites were distinguished from other Pennsylvania Germans in three ways: their opposition to the American Revolutionary War, resistance to public education, and disapproval of religious revivalism. Mennonites during this period supported the idea of separation of church and state and opposed the institution of slavery. The Swiss-German Mennonites that migrated to North America in the eighteenth and nineteenth centuries who settled first in Pennsylvania, then across the Midwestern states are the root of the former Mennonite Church denomination (MC), colloquially called the "Old Mennonite Church." This denomination had offices in Elkhart, Indiana, and was the most populous Mennonite denomination before merging with the General Conference Mennonite Church (GCMC) in 2002. The General Conference Mennonite Church was an association of Mennonite congregations based in North America beginning in 1860. The conference supported a seminary and several colleges. It became the second largest Mennonite denomination with 64,431 members in 410 congregations in Canada, the United States and South America in the 1990s. After decades of increasingly closer cooperation with the Mennonite Church, the two groups voted to merge in 1995 and completed reorganization into Mennonite Church Canada in 2000 and Mennonite Church USA in 2002. 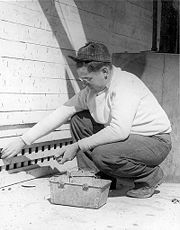 Mennonite conscientious objector Harry Lantz distributes rat poison for typhus control in Gulfport, Mississippi (1946). In the United States, the Civilian Public Service (CPS) provided an alternative to military service during World War II. From 1941 to 1947, 4,665 Mennonites, Amish and Brethren in Christ were among nearly 12,000 conscientious objectors who performed work of national importance in 152 CPS camps throughout the United States and Puerto Rico. The draftees worked in areas such as soil conservation, forestry, firefighting, agriculture, social services and mental health. Mennonites in Canada were automatically exempt from any type of service during World War I by provisions of the Order in Council of 1873. During World War II, Mennonite conscientious objectors were given the options of noncombatant military service, serving in the medical or dental corps under military control or working in parks and on roads under civilian supervision. Over 95 percent chose the latter and were placed in Alternative Service camps. Initially the men worked on road building, forestry and firefighting projects. After May 1943, as a labor shortage developed within the nation, men were shifted into agriculture, education and industry. The 10,700 Canadian objectors were mostly Mennonites (63 percent) and Doukhobors (20 percent). All Mennonites and Amish emphasize elementary education and want their children to learn to read (necessary for reading the Bible and devotional literature), to write, and to do arithmetic (necessary for farming, carpentry, sewing, and other trades). However, many Mennonites have been traditionally suspicious of and often opposed to higher education, seeing it as likely to destroy faith and lead the person to enter into and accommodate to what many Mennonites call "the world" or "worldliness." Thus some Mennonites, and especially the Amish, stop their schooling at the eighth grade; others stop whenever the state permits people to quit school (typically at age 16). Still others stop after graduation from high school. Some Mennonites send their children to public schools. Others set up their own schools, and still others home-school their children. Several Mennonite groups have their own private or parochial schools. The Canadian providence of Quebec does not allow these parochial schools as the Quebec government imposes its curriculum on all schools (public and private), while private schools may only add optional material to the compulsory curriculum but may not replace it. This policy has resulted in several legal cases. Over the years there have also been numerous cases in the United States dealing with attempts by governmental authorities to get Mennonite and Amish groups to submit to the orders of government school officials concerning the education of their children. The Mennonite church has no formal celibate religious order, but recognizes the legitimacy of both the single state and the sanctity of marriage of its members. Single persons are expected to be chaste, and marriage is held to be a lifelong, monogamous, faithful covenant between a man and a woman. Divorce is discouraged and it is believed that the "hardness of the heart" of people is the ultimate cause of divorce. Some Mennonite churches have disciplined members who have unilaterally divorced their spouses outside of cases of sexual unfaithfulness or acute abuse. Until the 1960s or 1970s, divorce was quite rare. In recent times, divorce is more common and also carries less stigma, particularly in cases where abuse was apparent. Traditionally, very modest dress (apparent mostly in women's apparel) was expected, particularly in conservative Mennonite circles. However, as the Mennonite population became urbanized and more integrated into the wider culture, this visible difference has disappeared outside of conservative Mennonite groups. Many conservative Mennonite groups have required women members to wear a head veil or covering, based on the Biblical injunction in I Corinthians 11: 3-7. The Mennonite church in the Netherlands was the first Dutch church to have a female pastor—Anna Zernike, authorized in 1911. About one century later over 40 percent of all Doopsgezinde Kerk pastors are female. The Doopsgezinde Kerk was in the 1970s also the first Mennonite group to accept homosexual pastors (whether male or female), at least in the Netherlands. In 2001, when homosexual marriage was introduced in the Netherlands, the Doopsgezinde Kerk with the Remonstrantse Kerk was the first to solemnize homosexual marriages. Some regional conferences (the Mennonite counterpart to dioceses) of the Mennonite Church have acted to expel member congregations that have granted membership to non-celibate homosexuals. These expulsions have been and continue to be controversial in the moderate Mennonite conferences. The Dordrecht Confession of Faith was adopted on April 21, 1632, by Dutch Mennonites, by Alsatian Mennonites in 1660, and by North American Mennonites in 1725. However, there is no official creed or catechism of which acceptance is required by congregations or members. On the other hand, structures and traditions as in the Confession of Faith in a Mennonite Perspective are considered generally normative in Mennonite Church Canada and Mennonite Church USA. There is a wide scope of worship, doctrine and traditions among Mennonites today. The following are main types of Mennonites as seen from North America. 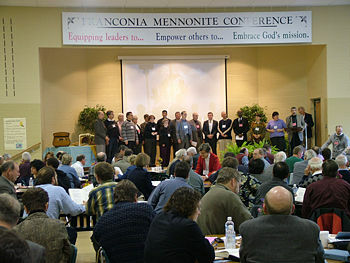 Moderate Mennonites include the largest denominations, the Mennonite Brethren and the Mennonite Church (USA and Canada). In most forms of worship and practice they differ very little from Protestant congregations. For most of these groups there is no special form of dress and no restrictions on the use of technology. Worship styles vary greatly between different congregations. There is no formal liturgy; services typically consist of singing, scripture reading, prayer and a sermon. Some churches prefer hymns and choirs; others make use of contemporary Christian music with electronic instruments. These Mennonite congregations are self-supporting and appoint their own ministers. In groups, ministers and bishops have received no salaries for their ministry, but have had to support themselves and their families in addition to doing their church work. There is an emphasis on peace, community, and service. Banning is rarely practiced. Excommunication can occur, however, and was notably applied by the Mennonite Brethren to members who joined the military during the Second World War. Service in the military is generally not permitted, but service in the legal profession or law enforcement is acceptable. Outreach and help to the wider community at home and abroad is encouraged. Reformed Mennonites represent the first division in the original North American Mennonite body, forming the Reformed Mennonite Church which was formed in the early nineteenth century. Reformed Mennonites see themselves as true followers of Menno Simons' teachings and of the teachings of the New Testament. They have no written church rules, but rely solely on the Bible as their guide. They insist on strict separation from all other forms of worship, and dress in conservative "plain" garb that preserves eighteenth century Mennonite tradition. However, they allow their children to attend public schools and have permitted the use of automobiles. Holdeman Mennonites were founded from a schism in 1859. The formal name of the denomination is the Church of God in Christ, Mennonite, with about 19,000 members worldwide. They emphasize evangelical conversion, strict church discipline, and the shunning of the excommunicated. They stay separate from other Mennonite groups because of their emphasis on the doctrine of being the one true church and their use of strict shunning against their own excommunicated members. Old Order Mennonites cover many distinct groups. Some groups use horse and buggies for transportation and speak German while others drive cars and speak English. What most Old Orders share in common is conservative doctrine, dress, and traditions, common roots in nineteenth and early twentieth century schisms, and a refusal to participate in politics and other so-called 'sins of the world'. Most Old Order groups also school their children in Mennonite-operated schools. 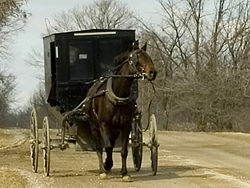 Stauffer Mennonite or Pike Mennonites represent the first and most conservative form of Horse and Buggy Mennonites. They were founded in 1845, following conflicts about how to discipline a child and spousal abuse by a few Mennonite church members. They almost immediately began to split into separate churches themselves. Today these groups are among the most conservative of all Mennonites, outside the Amish. They stress strict separation from "the world," adhere to "strict withdrawal from and shunning of apostate and separated members," forbid or limit cars and technology, and wear "plain" clothing. They are now considered to be part of the larger less-conservative Horse and Buggy Old Order Mennonite group which formed from later schisms. Horse and Buggy Old Order Mennonites came from the main series of Old Order schisms that began in 1872 and ended in 1901 as conservative Mennonites fought the radical changes that the influence of nineteenth century American revivalism had on Mennonite worship. Most allow the use of tractors for farming. They stress separation from the world and wear "plain" clothes. Unlike the Stauffer Mennonites, their form of the ban does not include shunning. Automobile Old Order Mennonites, like other Old Order groups, evolved from the main series of Old Order schisms from 1872-1901. They often share the same meeting houses with Horse and Buggy Old Order brethren, with whom they parted ways in the early 1900s. Although this group began using cars in 1927, the cars were required to be "plain" and painted black. The largest group of Automobile Old Orders are known today as 'Black Bumper' Mennonites because some members still paint their chrome bumpers black. Conservative Mennonites are those Mennonites who maintain somewhat conservative dress and do not engage in television and radio, although carefully accepting other technology. They are not a unified group and are divided into various independent conferences and fellowships such as the Eastern Pennsylvania Mennonite Church conference. Progressive Mennonite churches allow homosexual members to worship as church members and have been banned from membership in the moderate groups as result. The Germantown Mennonite Church in Germantown, Pennsylvania  is one example of such a progressive Mennonite church. In 2003, there were 1,297,716 Mennonites in 65 countries. Africa had the highest number of Mennonites with 451,959 members, closely followed by North America with 451,180 members. The third largest concentration of Mennonites was in the Asia/Pacific region with 208,155 members, while the fourth largest region was the one encompassing South America, Central America and the Caribbean, with 133,150 members. Europe, the birthplace of Mennonites, had 53,272 members. Africa has the highest membership growth rate by far with a reported 10 percent-12 percent rise every year in some countries, particularly in Ethiopia. Growth in Mennonite membership is slow but steady in North America, the Asia/Pacific region, and in South/Central America. Europe has seen a slow and accelerating decline in Mennonite membership since about 1980. Some churches in North America have begun profiling potential members and with some success have targeted inner city minorities in their recruitment efforts. Growth in the traditional Mennonite churches is out-pacing growth in the moderate churches. The most basic unit of organization among Mennonites is the church. There are hundreds or thousands of Mennonite churches, many of which are separate from all others. Some churches are members of regional or area conferences. Some, but far from all, regional or area conferences are members of larger national or world conferences. Thus, there is no single authorized organization that includes all Mennonite churches worldwide. Worship, church discipline and lifestyles vary widely between progressive, moderate, conservative, Old Order and orthodox Mennonites in a vast panoply of distinct, independent, and widely dispersed classifications. For these reasons, no single group of Mennonites anywhere can credibly claim to represent, speak for, or lead all Mennonites worldwide. The remaining 20 or so other smaller independent groups and conferences number only a few churches and a few hundred members. Finally, there are 100 or more small independent churches with one or a few congregations numbering from as many as 2,000 members to as few as a 40 members. The Mennonite World Conference is a global community of 95 Mennonite and Brethren in Christ Mennonite national church organizations from 51 countries on six continents. It exists to "facilitate community between Anabaptist-related churches worldwide, and relate to other Christian world communions and organizations," but it is not a governing body. Rather, it is a voluntary community of faith whose decisions are not binding on member churches. The member churches of the Mennonite World Conference include the Mennonite Brethren, the Mennonite Church USA, and the Mennonite Church Canada, with a combined total membership of at least 400,000, or about 30 percent of Mennonites worldwide. In 2003, there were about 323,000 Mennonites in the United States. About 110,000 were members of Mennonite Church USA churches, while about 26,000 were members of Mennonite Brethren churches. About 30,000 (according to Scott) were members of conservative and old order churches. (That leaves about 159,000 Mennonites unaccounted for in other United States' churches). Other sources list 236,084 total United States Mennonites. Total membership in Mennonite Church USA denominations decreased from about 133,000, before the merger in 1998, to about 114,000 after the merger in 2003. The Mennonite Church USA has begun profiling potential members and has been successful at recruiting inner-city minorities into the church in several large cities in the United States. Significant growth in the conservative churches seems to be occurring by itself in the already existing communities. In Canada, in 2003 there were around 130,000 Mennonites. About 37,000 of those were members of Mennonite Church Canada churches and about another 35,000 of those were members of Mennonite Brethren churches. About 5,000 belonged to conservative Old Order Mennonite churches, or other ultra-conservative and orthodox churches. (That leaves about 55,000 Mennonites unaccounted for in other Canadian churches). As of 2003, there were an estimated 80,000 Old Colony Mennonites in Mexico. These Mennonites descend from a mass migration in the 1920s of roughly 6,000 Old Colony Mennonites from the Canadian provinces of Manitoba and Saskatchewan. In 1921, a Canadian Mennonite delegation arriving in Mexico received a privilegium, a promise of non-interference, from the Mexican government. This guarantee of many freedoms was the impetus that created the two original Old Colony settlements near Patos (Nuevo Ideal), Durango, and Cuauhtémoc, Chihuahua. ↑ Mennonite Disaster Service. mds.mennonite.net. Retrieved October 19, 2007. ↑ Martyrs Mirror, first published in 1660, documents much of the persecution and killing of Anabaptists and their predecessors. ↑ A Minute Against Slavery, Addressed to Germantown Monthly Meeting, 1688. www.qhpress.org. Retrieved October 19, 2007. ↑ Confession of Faith in a Mennonite Perspective www.mcusa-archives.org. Retrieved October 19, 2007. ↑ 2003 Mennonite & Brethren in Christ World Membership. www.mwc-cmm.org. Retrieved October 19, 2007. 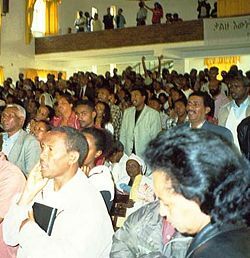 ↑ Ethiopian church strives to keep spiritual fires alive. mennoweekly.org. Retrieved October 19, 2007. ↑ United States and Worldwide Mennonite Membership Statistics. www.mcusa-archives.org. Retrieved October 19, 2007. All links retrieved September 17, 2018. This page was last modified on 17 September 2018, at 21:03.